Transparent Window Armour System Technologies – Aadi Defence Pty Ltd.
To maximize the use of natural light in modern buildings, current buildings are designed with large windows and open internal office layouts often with glass walls. In todays world there are an increasing number of foreign and domestic threats that can result in an attack against a building. Structural engineers today face a new challenge and require solutions to help structures resist potential attacks. Stand off distance option 1: Block off building with physical blocks to restrict access to the area adjacent to building. The main disadvantage with this option is that building integrity may remain but shrapnel or debris can still penetrate the building. Another disadvantage is that the area adjacent to the building can still be penetrated by rioting crowds. Stand off distance option 2: Restrict accessibility to building through screening stations and layers of protected areas. The main disadvantage to this option is these checkpoints still need protection and ballistic resistance for these points is important to protect guards. 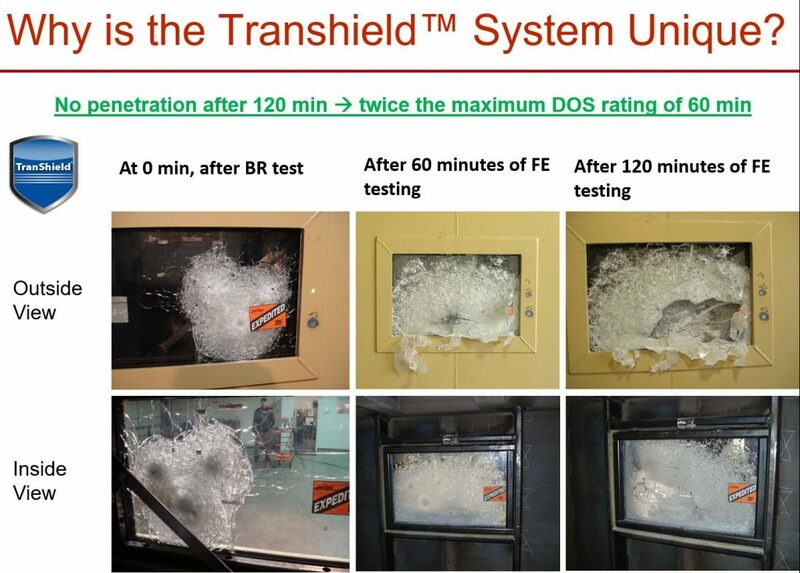 Transparent Window Armour System – Force Entry Ballistic Resistance (FEBR), Blast resistance and hurricane protection. • Certified by the US Department of State. • Best in class for Forced Entry Ballistic Resistance transparent armour. • Over 7x lighter than the next best in class (FEBR-15min). • The only certified FEBR system that defeats armour piercing rounds with > 60 minutes of force-entry protection. • Tested to 120 minutes against FEBR standard (Twice the maximum DOS rating). • Can be retrofitted to existing structures due to its lighter and thinner nature. • Compatible with most existing window apertures. Domestic Buildings: for protection against Car bombs, suicide bombs, lone/ small group gunmen and Improvised explosive devices. Examples: Court houses, Correctional facilities, Embassies and other government buildings. Foreign buildings: for protection against the same as domestic; as well as other coordinated attacks by insurgent fighters, RPG/Mortar attacks, rioting crowds. Current Standards: FE/BR (Force Entry and ballistic resistance) is the measure of a buildings ability to withstand ballistic and forced entry. It is governed by the US Department of State. Basically the structure is shot at with the required ballistics before a team of strong men attempt to break through using a prescribed set of manual/tools. Physical Security Standards: The FE/ BR requirements vary according to building classification and the level of protection of the individual structural item (ie window or door) depends on this classification. For a safehaven which is a designated area within a building serves as an emergency sanctuary and provides 60 minute force entry and ballistic-resistant (FE/BR) protection.